It’s no secret that the games of baseball and softball need a lot of equipment. You need a ball, a bat, and a glove to play the game. But if a player wants to be much better, they have to practice a lot more. That means there’s also a demand for training tools, and the Louisville Slugger UPM 45 Blue Flame Pitching Machine is one of the most popular training tools there is for youth baseball players. ===>> See this top-rated pitching machine here. This Louisville Slugger pitching machine is mainly used to pitch to a young player when they’re practicing hitting the baseball. Its features are excellent for this purpose. The coach won’t have to do the pitching themselves, which can be difficult when you’re the coach and you’re trying to hit the strike zone of a 10-year old hitter. It’s also not that easy to hit the same spots with the same speed for your pitches. It can throw a variety of balls. Many pitching machines can only throw a specific type of ball. This one can throw regulation baseballs and softballs, ultra lite baseballs and softball, wiffle balls, and even soccer balls. All these balls can be used and the pitching machine won’t damage them in any way. You can choose a particular speed setting. If you’re using a regulation baseball, you can set it to go as slow as 18 mph to as fast as 40 to 43 mph. Use an ultra lite softball and the speed can go up to 60 mph. With an ultra lite baseball, the top speed for Louisville Slugger UPM 45 Blue Flame Pitching Machine can go up to almost 70 mph. It can even pitch a slow pitch softball in a 10 to 12-foot arch. Is The Pitch Accuracy Consistent? The ball consistently hits the same general area of the strike zone. You can aim this so you can target a particular area, whether it’s low and inside or high and outside. There’s a slight variation in the exact place where it hits, but this is normal since pitches don’t usually hit the same exact place each time. This weighs just 25 pounds. It’s also not too big so it can fit in the trunk of a car. That means it’s very portable, as a single person can haul this up to the baseball field. The Blue Flame is also manually operated. It doesn’t need any electrical power at all. It uses springs instead to supply the power for the pitches. How Easy Is This Machine To Operate? This machine is also easy to use. Learning how to use Louisville Slugger UPM 45 Blue Flame Pitching Machine isn’t difficult. You just put the ball on the arm, and then you release the ball by stepping on the spring lever. It comes with a speed chart so you know how to adjust the Blue Flame Pitching Machine settings for the pitching speed you want. Once you’ve chosen the speed setting, you can lock it in place so it pitches the ball consistently. It’s rated for heavy duty use. The build is very sturdy and there aren’t any flimsy materials for you to worry about. Of course, eventually the spring that powers the pitches will wear down, but that won’t be a while since it’s rated for 20,000 pitches. When that limit is reached, you don’t even have to buy another Louisville Slugger pitching machine. You just need to buy the spring, which is easy enough to find online. Go online and you’ll probably notice the virtually universal acclaim in the numerous Blue Flame Pitching Machine reviews. It’s just that good, and it’s not surprising that it’s the Official Pitching Machine of the Babe Ruth League and Pony Baseball and Softball. Let’s enumerate some of the most compelling reasons for why so many coaches and players love this pitching machine. It’s affordable. Let’s start with this crucial advantage right away, since many teams don’t have large budgets for baseball and softball training equipment. You may find other excellent pitching machines out there, and some are even professional quality. But then they also cost a whole lot more. With the UPM 45, you get an amazing combo of high quality and low price. How Does The Blue Flame Help Players? It throws to the same general area each time. This is a relief for everyone. Coaches love it since not every coach is a terrific pitcher who can even hit a small boy’s strike zone each time. This placement consistency saves time and effort. Also, it alleviates any worry by the hitter that they can get hit. This kind of apprehension can make it almost impossible for them to concentrate on just their hitting instead. This also helps hitters practice on pitches that are more difficult for them. They can learn what they have to do for inside or outside pitches, whether they’re low and high. Finally, the hitters are able to identify how a baseball looks like when it’s going to hit the strike zone. So during game day, they can lay off balls and wait for strikes. You can set the speed and it remains consistent. Practicing your hitting requires getting the timing right. But that’s a problem if the pitches vary in their speeds. With the UPM 45, that’s not a problem at all. You get the same speed you’ve set each time. You can even practice trying to catch up to 60 mph pitches or practice with slow pitches at first. This means that as the player improves with his timing, they can deal with more pitches of varying speeds—and recognize how these pitches approach the plate. How Does The Blue Flame Help Coaches? It’s portable. A single person can take care of bringing this into the baseball field. You can fit it in the trunk of a car, and at 25 pounds a single person can carry this too. It’s also manually operated, so there are no dangerous cords on the playing field and you don’t use up a lot of money burning through lots of batteries. Versatile. You can use just about any kind of baseball and softball with this pitching machine. That gives you lots of options regarding what to work on. If you’re a coach of both baseball and softball, you just need this single machine for both teams. It’s not just for throwing strikes for hitters either. You can aim this towards your fielders so they can practice dealing with fly balls and grounders. Again you get consistent placements so your players can practice their mechanics. In fact, you can use this even for volleyball, soccer, or even basketball. For multi-sports coaches, it’s a godsend. What About Ease of Use and Portability? It’s very easy to use. You put the ball on the arm and you spring the lever. There’s a guide on how to set it up for various speeds. It’s really that simple. The Blue Flame is very durable. It’s sturdy, so you don’t have to worry about it breaking down when it gets hit by a baseball or when it gets dinged during a bumpy ride in the car trunk. It can be said that a device is only as durable as its flimsiest component. In this case, this is the spring that powers the pitching arm, and it’s hardly fragile. With its 20,000-pitch capability, it can last for a very long time. You also need to just replace the spring when it’s at the end of its lifespan, so there’s no need to buy a brand new pitching machine as replacement. It’s very easy to assemble as well. Not all coaches are DIY geniuses, but it doesn’t take a genius to put this thing together. The truth of the matter is that there’s really nothing seriously wrong about the LS UPM 45. Like many gadgets, you will need some time to learn how to use Louisville Slugger UPM 45 Blue Flame Pitching Machine properly. You’ll have to consult the pitch speed guide extensively at first before you become familiar with it. Perhaps the most notable “missing piece” here is that there’s no option to practice on curveballs and sliders. It only throws regular pitches. For the curveballs and sliders, you’ll need a good pitcher to make the throws. As many coaches and players have noted, it’s almost inconceivable that this pitching machine will be considered as anything less than world-class. It’s consistent, reliable, durable, easy to use and assemble, and can be used for wide variety of drills for several different sports. This is an excellent training tool for youth baseball, and senior leagues can make use of this too. It saves the coaches time and effort because they don’t have to do the pitching themselves. It helps train hitters with their hitting mechanics without the threat of getting hit, and it can even train fielders as well. It’s affordable too. 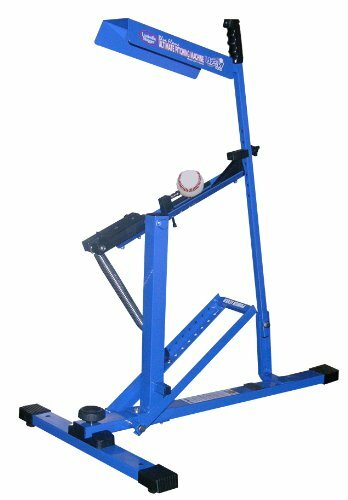 If you’re a coach of youth baseball, just get the Louisville Slugger UPM 45 Blue Flame Pitching Machine. It’s one of the worthiest investments you’ll ever make—you improve your team a lot and you don’t spend too much time, effort, and money. Want this Blue Flame with Free shipping? This is a good pitching machine. We used it all season long for 7-8 years old. It’s durable and easy to use.